While many UFO sightings take place high in the sky or at a distance, occasionally one will be seen close up to the witnesses. There have even been the occasional reports of UFO’s being too close at times. One such report comes from the Appalachian Mountains of Southeastern Kentucky. It was a cold night on January 14th, 2002 as a CSX train with two engines was pulling a 16,000-ton line of coal and freight cars from Russell to Shelbiana, Kentucky. Near milepost 42 the double track was running beside the Big Sandy River and a cliff face carved out of the mountainside to provide room for the tracks. The terrain is rugged and concealing along the river valley. At 2:47 a.m., as the train was approaching a bend, the conductor saw lights ahead. Figuring it was just another train coming toward them on the other track he doused his own headlights as a courtesy. Twin tracks near CSX Cumberland Subdivision at Paw Paw, West Virginia. Photo Sturmovik. CC-BY-SA-3.0; Released under the GNU Free Documentation License. Then the encounter went haywire for the train. As it came around the bend the electrical system began to cut in and out and the diesel engines of both locomotives died. The proximity alarm began to scream a warning at the driver. Looking out the window the train crew saw a very strange sight. Hovering over the river and the tracks were a group of unidentifiable objects. They were described as being of a metallic silver color with multiple colored lights on both the bottom and middle section of the craft. At least three of the objects were directing what looked like search lights onto the surface of the river. The train crew could see no windows on the craft which they estimated as being maybe 20 feet long and about half that much tall. What was of the most imminent concern was one of the objects hovering about 10 feet above the tracks they were on. Despite the emergency braking system activating as soon as the power died, one does not stop 16,000 tons instantly. Inevitably the UFO was struck by the train’s locomotive. It clipped the front engine and then bounced around to cut a piece from the second engine and damage the first two coal cars. The unidentified objects immediately took off from the area and vanished into the sky. It took nearly two miles for the train to finally come to a halt. After it stopped the power returned and the crew contacted their dispatcher in Jacksonville, Florida to appraise him of the situation. After a quick inspection of the damage they were ordered to try and make it to the Paintsville rail yard where, even though it was barely operational anymore, they would be able to drop off the damaged equipment. Their new destination was about 20 miles further down the tracks and they made it to Paintsville by around 5:15 a.m. The crew was immediately taken off the train and questioned by a group of men they did not know. The only thing they were sure of was that they were not railroad personnel. After two hours of this, the men were taken out and placed on a smaller railroad carrier headed for Martin, Kentucky. They noticed as they left that the two engines and two damaged rail cars had been removed from the train but they didn’t see where they had been taken to. After arriving at Martin, the train crew spent more time being interviewed by railroad inspectors. They were finally sent to Shelbiana for an eight-hour layover before their next shift began, working another train back towards Russell, Kentucky. As they passed through Paintsville they saw absolutely no evidence of the train they had been in when they ran into the UFO or of the huge number of people that had mysteriously appeared to work on the damaged train. Official records of the repair of the engine state the crumpled roof and smashed window were caused by a rock slide in one of the train way tunnels that dot the tracks through this mountainous region. Still, no report of the rockslide or its cleaning up has been found. 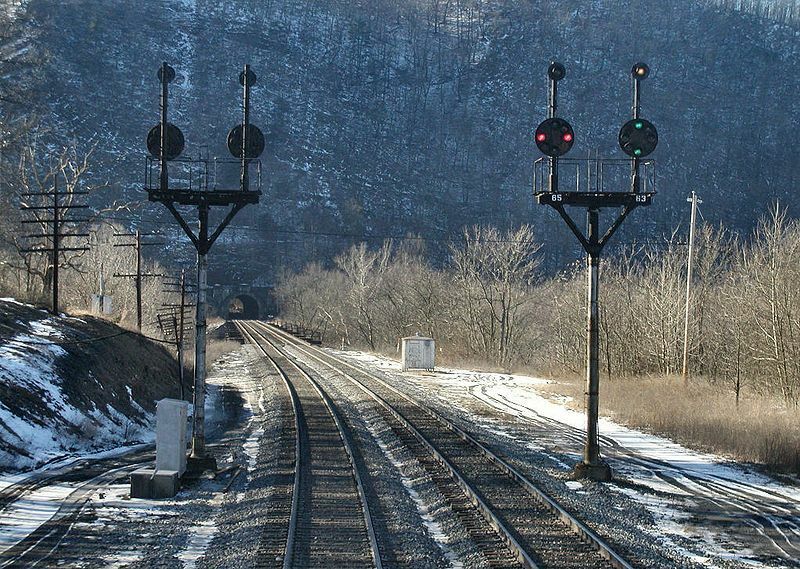 The CXS Railroad has routinely kept their business to themselves and rarely are incidents along the line made public unless a train has hit someone. That nothing of this incident, or even a rockslide, made it into any of the local newspapers is not unusual. UFO’s have often been spotted hovering over water. What they are looking for as well as what these particular objects were after is unknown. Whether the UFO the train hit managed to continue flying or crashed into the Big Sandy River is also unknown.